8 1/2 x 17 Rolled Blank Scroll | Blank Scrolls | Scrolls Unlimited, Inc. 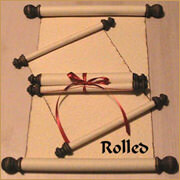 Need it just a little bit longer than the 8 1/2 x 11 - then this scroll would be perfect for you! ADD A SHEER BAG to make your presentation just a little more classier. Makes a great storage bag for later.